I had the chance this summer to pass by my old elementary school, Gonzalves Elementary, in Cerritos, CA, where I was bullied every single day as a kid. While there, I saw this sign – “bully free zone”. Part of me doesn’t believe a word of it. Part of me – and I’m a high school teacher – hopes they took real steps to mean what those words say. That was over 30 years ago. It’s still a tough image. This post is a final nail in a casket, a final shovel of dirt on a long since dead skeleton. But I still want to talk about it. It is in not discussing these things that they become charged with emotion. It is in ignoring, denying, keeping quiet about this that we create the ignorance of what it is and how to see it and how to solve it. So this post is about both my own experience of mobbing, and also about this bullying phenomenon in general. We can think of it as a tool to educate others. There are few images in this post, but I’ve added a filter or two to give them some feeling of the past. I was bullied from the third grade until sixth until all I did was sit by the wall and wait for recess between classes to be over. I later stood by the wall in Junior High (and when I didn’t I got bullied) and again in High School my first year (and when I didn’t I got bullied). When I switched schools, I was very careful to avoid people, and so, stood by the wall during break and lunch. It was only then, in that new High School that a group of curious friends who sat 50 yards away from me on the grass at lunch time called me over to them. I shook my head no, at every wave. So they discussed the matter, then got up and came over to me. That changed everything. But lets get back to bullying. Class itself (during grade school, 3rd to 6th grade) wasn’t exactly fun either. I focused on my studies, ended up in the 80s Cold War “GATE” program. Mensa sent me an invitation letter (which I turned down), but the mobbing continued and I fell back into regular classes once again, though there was to be no return to a focus on studies. My grades dropped. I just didn’t feel well at school or at home. I often wonder where I might be, what I might have accomplished, had I experienced an environment positive to my learning. It has been a long road. I am happily at journey’s end. I’ve read enough of the literature to know that the bullies were as much prisoners of social mob mentality as I was. None of us knew it. We were just kids. There was an island without adult supervision, the blacktop, and the Lord of the Flies reigned supreme. Teachers did their jobs and taught subjects, parents dropped us off and picked us up. Warning signs weren’t seen as warning signs, or worse were ignored. I remember my grandmother saying to me on my 9th birthday as I waited with anticipation by the gate, “someone will show up soon, Jacob. Just you wait.” I sometimes justify it all telling myself that, back then, people were ignorant of what bullying was. Then it all goes up in smoke when I recall that the Principal, in pride, said to my mother that there was absolutely no mobbing going on in his school. He later called me in to his office, asked who the “ring leaders” were, called them in and forced them to apologize to me. They did, and he washed his hands of it. My god, did the ridicule intensified after that! I was beat up after school about four times that month. I’ve had my share of discussion around this topic before, and I’ve encountered in those discussions a great deal of misconception around bullying. Just look at the discussions around Google’s support for those who are bullied, which happened a week or so ago on Spirit Day. (Although Spirit Day is associated primarily with mobbing as it happens to LGBT individuals, the phenomenon happens to ALL sorts of people, including hetero white anglo-saxon protestant males like myself.) 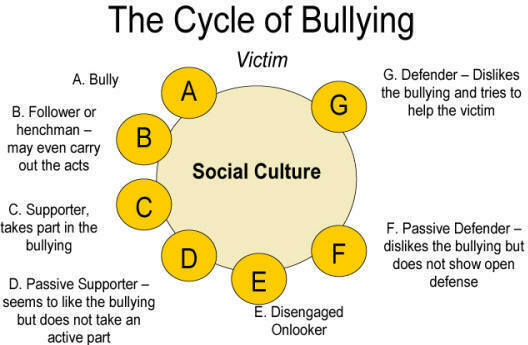 It is often the case that bullying is seen as a two person show. That there is some one person doing the bullying, and someone else being bullied. With this view, so common, the solution seems to end up some kind of punishment for the individual bully. People seem to think that punishing a bully (bullying a bully, as it is phrased sometimes) is the solution to stopping bullying. The reality is, this is not the case, and so the punishment doesn’t fit the crime. In fact this just perpetuates the social culture that bullying develops in. The greater part of those participating in bullying, with such a view, quietly go their way without consequence. 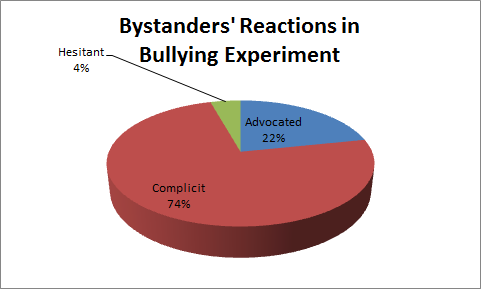 The image shows a typical bullying situation (in this case staged for an experiment), where there isn’t simply one person doing the bullying, but a number of others who actually advocate the treatment. In that case, how could the punishment of one person not only do justice to the victim, but also prevent the bullying situation from happening again? I loved days when it rained. Instead of recess out on the blacktop, we would stay inside and our teacher would put us in two teams and we’d play trivia from his small green trivia books he had. Most of the trivia was based around the natural sciences (a fancy of this particular teacher). The mobbing stopped on those days. Instead, I was Mr. Science. Having me on the team was a guarantee that that team would win, so that the preliminary team building became a compromise over several of the stronger kids as a trade off for me. I enjoyed it. I still do. Something about it though reeks of the symptomatic helplessness of that group of youngsters. Mr. Science was a heavy price to pay. Somehow I think they were simply jealous. And maybe a bit afraid of me. Up until the 3rd grade I was socially the leader of the group. Because of a rumor my brother spread that I still wet my bed, overnight I was taunted, mocked and laughed at, eventually spit on, beat up, ignored. Oddly, throughout it all, I was praised for my knowledge. The words above are from Caroline Friehs’ blog, and I find they highlight the low point of my bully experience. To put it simply, I had a black book. I warned my attackers once about this book, in the fifth grade while playing tetherball, that every day I wrote down what they did and what they said and all of their names, and that one day, I would come back to get them, i.e., to kill them. I say I had a black book, but the book wasn’t real, of course. It was a defensive measure one day when the teasing and laughing became too intense to handle for a ten year old boy. The reality was, I didn’t need a book. I remember all of their names even to this day: Shawn B.; Mario M.; Jon L.; Burton B.; Aaron (A.J.) L. (A.J. worked at Home Depot and asked my mother, a carpenter, how I was doing once. I appreciate him asking); Jason T.; Michael S.; Isabel B. Ordinary names. To his credit, Germane B., one of the newer kids during the sixth grade, took some flack for standing up and defending me. I am not proud of that black book comment. I consider it one of my weakest moments in my life. It highlights what many, many others have gone through. What I do know is that that kind of extreme daily circumstance can easily erode the strongest moral character. Every time I hear of the latest High School shooting I think of the social situation, home and at school, that drove those kids to develop such isolated and extreme thinking, and final decision. In some cases the bully is the shooter, in others the bullied. Lord of the Flies, right under the noses of disinterested adults. I am not altogether sure how I ended up going down a different road. I recall my fantastic imagination running away with me, and thinking of some unrealistic day when I would have absolute power over those kids. There was so much rage. I wanted to have revenge, to make them feel miserable. Maybe I’m being too open here. What I do know is that I disapprove of giving altogether too much media attention to school shootings and school shooters. This obscures the social situation that created the problem, and instead focuses on who the person as an individual was. It also lets everyone else complicit in the bullying off the hook. They move on in the aftermath of the tragedy, and no one discusses how they played a part in the cycle of bullying. I also tend to think that the hype around these cases normalize shootings as a possible way out for those who don’t see a way out. Certainly these tragedies need some attention, but too much of it is given to the “profile”. Shawn was really the “ring leader” or driving force of the bunch, the A in the diagram above. It was a strange bit of circumstances however, that made me feel a bit of reconciliation over those years of his bullying. In Junior High I was like a ghost. New constellations of kids formed at a new school, and so the mobbing subsided some. High School came, and I found myself with a group of kids that were beginning, once again, to pick on me. One of them was a former bully from elementary school. I simply didn’t know anyone else, and the hurt they caused was an easy price by then for the familiar company. I wanted to simply sit with others whom I knew knew me. So these mobbing tendencies were an incentive for change. As it happened, I was seated right next to Shawn B. in my home economics class one random day, midway through the year. A lot had changed. He was a punker, mohawk, and everything that went along with it. He asked me one day quietly during a lesson, “Jay, did you really have that black book?” He had remembered this “book” after four years. I was still hurt, prideful, and instantly recognized the threat he might be if I let down that guard and offered no further consequences. And so I lied and said, “Yes. I still have it too.” It was the obvious answer. The next day he asked me to come with him. He wanted to show me something. Turns out he wanted me to hang out with him and his friends. Me and a bunch of punkers. It was a strange mix. Everybody in black and metal and me, uncut and in hand-me-downs. But I was accepted. Shawn defended my right to be in the group, and though I don’t think the alphas of the group understood why I was there, they did get to know me some, and accepted that I simply had no where else to go. Probably just like them. I recall there were hierarchies within that group as well. Me and a guy named Billy became friends, I guess. I began to be a jerk, mean to fellow students when I hung with Billy in our mutual classes. I would be unkind to show just how crazy I was. After my first year of High School I switched schools and all that was gone. Again I was a ghost. I didn’t talk to people, and reverted to the wall and my studies. I know very little of what happened to those people. Switching schools meant no High School reunion with the kids I hated. All of this left me of course viewing everything in some stereotyped, systematic way. Everything fit like out of some mobbing textbook. It all lines up. Classic, troublesome case. From about the fourth grade (I was nine) until I was 16, I talked to virtually no one. Home life wasn’t exactly friendly and nurturing either, and so, I spent a long period in isolated silence. Of course this wasn’t healthy, but it was the hand I was dealt. During these years I developed certain phobias, twitches (coughing, shoulder spasms, etc), idiosyncrasies. I began biting my nails. Above all, I lived in my head. I thought. It was only when a curious group of strangers waved me over to their group out of curiosity (at my new High School), as I stood by the wall during lunchtime, that I began talking to, and finally trusting people. Even then there were road blocks. I had psychological defense mechanisms like you wouldn’t believe, and it took intense therapy, finished just recently, to sort through it all. I’ve written of this sort of reactionary behavior before. At every point throughout this hard life — and I’ll admit with nearly sealed lips that this is only part of that story — at every point, there has been art. There has been writing. There has been music. There has been creativity. When things have been at their worst, I’ve buried myself in shape, line, and tone. I doubt I could have survived it all without the ability to express the inner world on a blank page. In one of the images of this series, there is one Mrs. Shell who complimented my art which, at the time, was about all there was for me. There are many grey areas in this history. Friends became enemies, enemies became friends. Germain B, once my defender when he first came to Gonzalvez, beat me up in Junior High. The reverse was also true, and they need mentioning here. A.J., who beat me up, showed concern once, albeit when I wasn’t present. Again there was Shawn B. who invited me in to his group of friends. Lisa N’s older sister once took me aside when she saw how her sister’s friends (all my classmates) picked on me. She whispered in my ear, “Never forget that they make fun of you because they are jealous.” I nodded. My persecutors asked what she said, but of course it wasn’t theirs to know. Nancy M. who waved me over to her group. There are not very many more who kept me going forward, but those that did are etched in my mind as people who gave a damn. I obviously don’t have any images of the bullying. The phenomenon is a subtle situation of poorly fostered relationships. But I do have one, and only one, physical record of its occurrence. This series of images is from my sixth grade autograph book from the end of the year. We would go to Junior High after this and some of these people would disappear. I wanted people to sign my book, in all cases with the hope that they would say something nice. I saw how everyone filled their books with writing. Seeing as how mine was quite empty, I went to my teacher, then to a teacher that I barely knew, and finally to my own mother to fill in the blank pages. The images of this series were edited using Photo Editor to enhance something of the feel of human memory. For more information on bullying and its prevention, please see StopBullying.gov and Pacer’s National Bullying Prevention Center. There are also many, many publications on the subject. A great book in Swedish on the subject is Utstött – en bok om mobbning.